Once we feel an ache or pain in our body, we immediately try to figure out a solution to fix it or pretend it doesn’t exist. Oftentimes, though, we never sit with our pain and acknowledge it and its effects on our wellbeing. Meditation, which has seen a resurgence lately, is a simple way of acknowledging your pain and breathing through it. 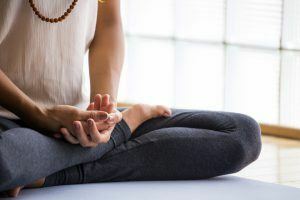 Meditation, in its many forms and mantras, can be a great complement to your regular pain treatments. Mindfulness, a form of meditation that involves focusing on different parts of the body and observing (with your mind’s eye) what you feel, has been shown in clinical trials to reduce chronic pain by 57 percent. That same article labels pain in two categories: primary and secondary pain. Primary pain is formed from illness, damage or injury. Secondary pain is your body’s reaction to primary pain and is often more intense and long-lasting. In addition to pain, mindfulness meditation has been linked to reduced stress, anxiety, depression and irritability. Regular meditation has been linked to improved memory, reaction times and physical stamina. Meditators are also less likely to suffer from psychological distress. Mindfulness is a simple form of meditation that anyone can do from the comfort of their own home. Once you understand the sensations and feeling of being in the present, it’s easy to be mindful. For pain sufferers, performing a “body scan” is a great way of being mindful while acknowledging your pain. Once you’re ready, start noticing the sensations in your toes. How do your toes feel? Warm? Tingly? Cold or aching? Really pay attention to how your body feels in the moment as you feel each unique sensation. Then, begin feeling the sensations of your legs. Make note of each sensation you feel. You might notice your mind wander at times (which is okay! ), and each time, gently return your focus back to your body. Spend 10 minutes feeling each sensation of your body, trickling up and ending at your head. Over time, you’ll become more aware of your pain and with regular meditation, you’ll be able to feel past your pain and find relief. Meditation isn’t and shouldn’t be a cure-all for your chronic pain. Seek a trained professional’s advice if you’re suffering from severe pain. However, if you’re looking for a simple, easy pain management solution to add into your schedule, try meditation. It’s free and requires only a short time commitment each day. Do you have 10 minutes for pain relief?